This was drawn with a 0.5mm mechanical pencil, on a 8�" x 11" High Bright (87) smooth finished paper. Finished off with a thick layer of Workable Fixatif. Here is another Manga I did, cause I was bored. 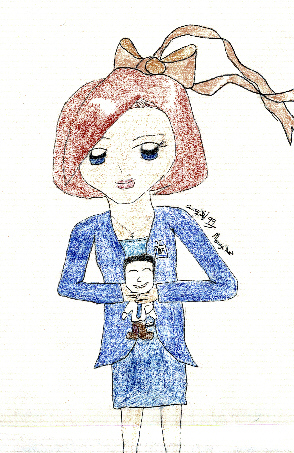 I had this strange idea to draw Scully holding a doll of Mulder. I drew a bow in to make it look childish *l* I guess sometimes Scully likes it when Mulder keeps his mouth shut *l* She can throw him around when she gets mad *l* I noticed I drew her hands around his neck. *l* j/k I was about to throw this one away to but my friend told me it was adorable, so I hung on to it.